I have a growing collection of old family photos and have made the time to scan most of them. Having only an average sort of scanner and no particular expertise, I've done what I could to get good scans and then made sure that the originals photos were put away safely. I now have quite a few digital copies of photos but they suffer from the usual problems of fading and (mostly minor) dust and scratch marks. My latest obsession has been learning to make better use of Photoshop Elements before attempting to do a "good" clean up of the old family pictures. I have a few books, and a growing list of helpful URLs, to get me started. I've nearly finished a practice run on a collection of photos from a trip to New Zealand with my sister in 2001. Neither my sister nor I had a digital camera in 2001. We both had our negatives scanned when they were developed. Unfortunately, many of the scans were pretty bad and my negatives were all but ruined in the process. Fortunately, the prints were done before the scans and they were fine. I've been fixing the colour and scratches on the existing scans, where I can, and rescanning the prints if they look too bad. My plan is to have them printed in a photobook, which I have been setting up as I go along. I think I'm getting pretty good at the dust and scratch repairs, including editing off the distracting yellow date stamps, if I do say so myself. I still have a way to go on colour correction. Once the New Zealand pictures are done I plan on moving on to my family pictures. Stage 2 of the photos project will be to work on family photos from as early as I have them, up to the 1970s and 1980s (if the images of 80s fashion doesn't scare me off them!). I'd like to make a photobook of the older family shots, especially, and give copies to my extended family. I'd also like to reproduce my grandparents' photo album as a photobook. I have lots and lots of photo work to do. Expect to see more photo posts in the future! I wrote a few days ago about the tragic death of young Leslie Miller COUPER. 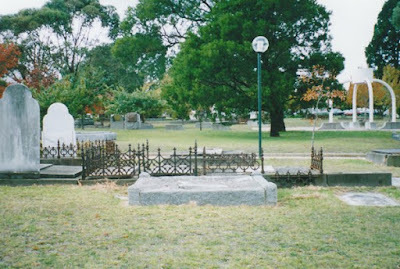 Here is his final resting place in Oakleigh Pioneer Memorial Park, Victoria, Australia. And here is the headstone which I assume once stood at the head of the grave (as headstones do!) but at the time of the photo (April 1998) it lay across the plot. Oakleigh is now a suburb of Melbourne, about 15 km from the CBD. The "Oakleigh Pioneer Memorial Park" operated as a cemetery from 1859 to 1959. The cemetery was opened as a park in 1988. 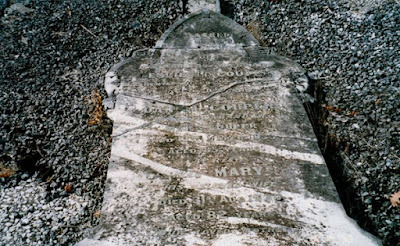 I was most fortunate that this headstone was still present when I took the photo in 1998 as I understand many were removed when the area was made into a park. So far as I know it's still there, but I haven't been back to check. Under the white structure on the right of the top photo are bricks inscribed with the names of those known to be buried there. That information is also in the cemetery database. A search on COUPER yields 14 entries, some of whom don't bear the name COUPER. They were people, mostly people connected to the family, whose burial Daniel COUPER authorised. I must remember to write a post sometime about the diagram I created (using Genbox) that shows Daniel's relationship to each of those people. The first time I went horseriding with school, my mother warned me not to wrap the reins around my wrist or hand. The warning came with a story about her uncle, who had been killed as a child when a horse he was leading had bolted, dragging him behind. Years later I found this uncle easily enough. He was my mother's great-uncle. His name was Leslie Miller COUPER, born 8 June 1887 and died 2 March 1897 aged just nine years old. He shares a grave in Oakleigh Pioneer Cemetery (Victoria, Australia) with his parents who died many years later. His headstone says that he was accidentally killed. A few weeks ago I was playing with the National Library of Australia's Historic Australian Newspapers site. The site is very well done, and worth a look even if you don't have relatives in Australia. I found a newspaper article relating to the death of Leslie Miller COUPER, but it was still undergoing quality checks so I couldn't see it right away. I was thrilled when I searched again and could read the short article. I wasn't prepared for how I would react to reading it though. Perhaps it was the graphic description of the injuries. Perhaps it was the fact that the dying boy was taken back to his family home, prompted me to think of him as part of a loving family. Whatever the reason, suddenly I found myself in tears for someone who had died over 100 years ago. This is the COUPER family of Oakleigh, Victoria, Australia. Someone is missing, but who? In the middle is Mary COUPER (nee ALLSOP), wife of Daniel Miller COUPER. Obviously he's not in the photo, that's not the answer I'm looking for! Mary and Daniel had nine children, all of whom survived infancy. 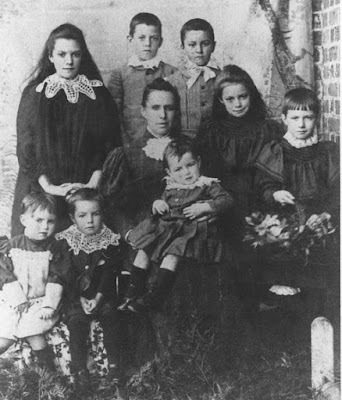 However, there are only eight children in the photo. The more I look at it, the more convinced I feel that the picture was taken c1893, before the birth of Albert Donald COUPER. That would give an age range for the children pictured of about 1 or 2 to about 13. Four girls and four boys with the youngest, Ruby, on her mother's lap. That may seem the obvious conclusion, but another possibility is that the photo was taken after the death of Leslie Miller COUPER, who was accidentally killed by a horse at age 9 in 1897. This would make the age range of the children about 3 to about 17. Still four girls, four boys but now it's little Albert in Mary's lap. I'd also have to reverse my assumption about the gender of one of the other children. So, is the youngest child a girl aged one or two, or a boy of age three or more? I think the former. What do you think? Any other clues or observations?